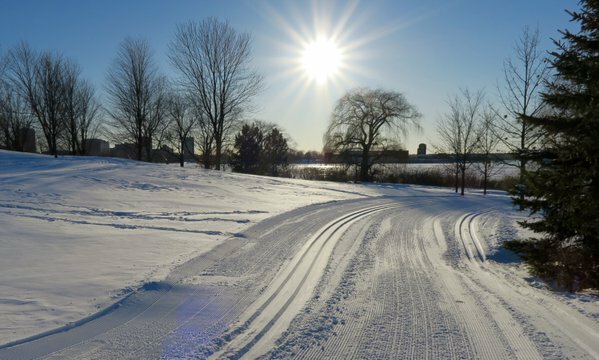 A groomed multi-use winter trail along the Sir John A. Macdonald (SJAM) multi-use pathway (MUP) that will promote active living, provide access to the Ottawa River shoreline, and welcome a diversity of users, whether they are walking, on skis, snowshoes or a snow bike. The salt-free trail will respect environmental sensitivities unique to the river shoreline. Two tracks will be set, one for snowshoers, walkers and bikers and the other for cross-country skiers, supporting both classic and skate style techniques. The walking track will follow the existing pathway. Serpentine loops will add distance to the ski track at the Selby Plains and Remic Rapids greenspaces and at open lands adjacent to the War Museum and Champlain Bridge, for an expected distance of 16 kilometres. Amenities along the trail include the Westboro Beach tobogganing hill, the John Ceprano rock sculptures and the café at the War Museum.